Colorful strips of paper and a few simple tools are all you need to create an infinite number of amazing projects with author and quilling expert extraordinaire Erin Curet! 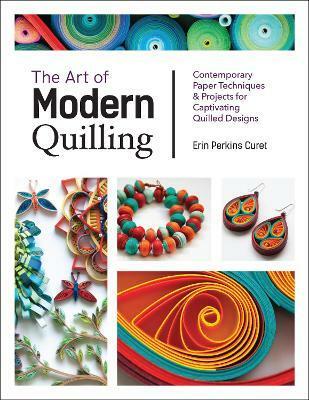 Erin shows you a host of innovative techniques and provides plentiful inspiration in The Art of Modern Quilling. New to quilling? That's no problem! It will only take a few minutes of instruction for newbies to be able to create modern paper crafts. You'll soon be making quilled jewelry, works of art that will dazzle, and fun household items that are as interesting to look at as they are useful. No matter how you cut it, quilling is the greatest craft that you have never heard of. Well, until now, that is! Erin Perkins Curet is a paper quilling artist, designer, and instructor who spends the great majority of her time in her northern Michigan studio. From this space of paper goodness, she hand rolls an infinite amount of quilling strips into all kinds of fun things that she shares and teaches through her website, Little Circles (www.littlecircles.net) and runs a small indie line of quilling paper, Culture Pop.